Loudoun County Board of Supervisors Chair Phyllis J. Randall: Tell Sister City Goyang, South Korea, That We’re Opposed to the Torture and Consumption of Dogs and Cats. Loudoun County, Virginia became Sister city to South Korea’s Goyang in 2013. Goyang is one of the largest dog meat consumption areas in South Korea. There are countless dog farms, slaughterhouses, markets and restaurants where the dogs, who are tortured their entire lives, end up being slaughtered in the most inhumane ways, such as by electrocution, hanging or beating; and then thrown into boiling water – sometimes while they are still alive. In many places, dogs are being killed in full view of other terrified, caged dogs; and this takes place in public and in broad daylight. In addition, many abandoned and stolen former pets end up in this industry, and are subjected to the same cruelty. Mayor Lee Jae-Jun’s goal is to “become the hub of the Korean peninsula’s peace economy, will be a message of peace echoing around the globe.” How can this be accomplished for as long as the illegal and barbaric dog and cat meat trade is rampant in his city? This cruel trade brings misery not only to its helpless and defenseless victims, but for those watching from around the world. The horrendous cruelty of the dog and cat meat trade will continue to dishonor and sully the reputation of the city through international scrutiny and opinion. The Mayor also committed “to further developing Goyang into one of the most prestigious future cities that will be admired by many around the world.” The best way for the Mayor to successfully realize his goals, is to end the dog and cat meat trades in Goyang. A Search Engine reveals the sickening scale of Goyang’s dog meat demand. 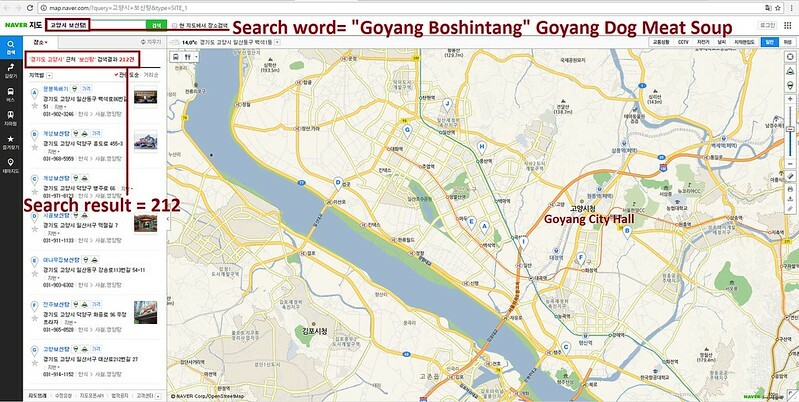 The searches resulted in: 275 Health Food Centers; and 212 restaurants in and around the city of Goyang alone. Even if half of these ‘Health’ Food Centers and restaurants serve dog and cat ‘ingredients’ in one form or another, just imagine how many dog/cat slaughterhouses must be present in and around Goyang in order to supply all of these outlets. 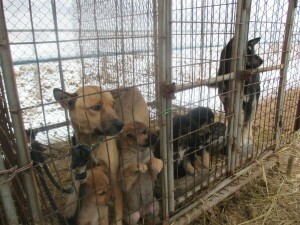 Please watch the video of a typical dog farm in Goyang https://youtu.be/EVVPruGyKj8. Please sign petition, call and email Loudoun County Board of Supervisors Chair Phyllis J. Randall TODAY! Call the Board of Supervisor’s Office! Send a copy of your letter to the Goyang Mayor Lee Jae-Jun! Goyang is one of the largest dog meat consumption areas in South Korea. 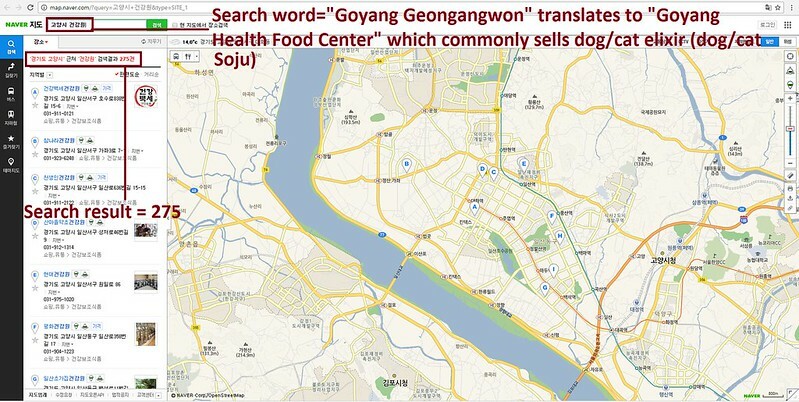 The Korean internet searches resulted in: 275 Health Food Centers which commonly sell dog/cat elixirs (also known as dog soju and cat soju); and 212 dog meat soup restaurants in and around the city of Goyang alone. No matter where you live PLEASE SHARE these actions with your friends – especially those who live in Loudoun County! it’s horrendous !!! it must be stopped !!! This is the most barbaric act ever! The torture and slaughter of innocent dogs and cats is just despicable. This is the year 2016 and not the dark ages, to behave like barbarians is not acceptable! If there is any humanity left in South Korea put an end to this cruelty. It’s a shame. If you want to stop animal cruelty, start with yourself and become vegan! I would never want my City to be associated with a City that allows this barbaric and disgusting practice. It is like being related to a serial killer. These people eat dogs and cats? I would never visit this country or have anything to do with them.